Every manufacturer has one series that best showcases their innovative technology and performance, and for Carrier the Infinity Gas Furnaces are tops of the line. With one of these in your home you will enjoy the service and reliability consumers expect, given Carrier’s outstanding reputation. The Infinity Series offers 3-4 models that allow you to choose the one to meet your heating demands. The Infinity 80 is basic and reliable, with 80energy efficiency and an affordable price tag. This unit features a variable speed blower and is equipped with the Ideal Humidity system that works with an internal humidifier to keep your interior climate comfortable in every way. This system is chosen by those in climates that require fewer heating days throughout the year and are also a model to consider in rental property or a secondary home. You’ll save on the initial cost and if fuel efficiency is not the top priority it makes good sense. The Infinity 96 gas furnace is designed to deliver up to 96AFUE and will lower your fuel costs significantly during the cold months. The variable speed blower along with the Ideal Humidity technology will make every room in your home warm and comfortable. The aluminized steel primary heat exchanger is durable and efficient with a generous warranty behind it. The Serpentuff secondary heat exchanger is just as reliable and long-lasting. The sealed combustion box is quiet and free from leaks that lower efficiency. The newest model for 2011 is the Carrier Infinity 98 Gas Furnace, with all the latest technology you expect from a leading furnace brand like Carrier. With a rated efficiency of 97.4 AFUE, and advanced features in home comfort, the Infinity 98 is one of the most advanced gas furnaces of the new heating season. 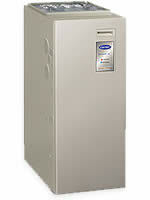 The last model is the Infinity ICS gas furnace that excels at producing perfect climate control throughout your home. The Infinity 96 and the Infinity ICS meet guidelines for efficiency and enjoy an Energy Star rating that lets you know you’ll be spending less on energy costs in the years to come. Look for federal tax credits for the purchase and installation of an Energy Star furnace and combine it with great performance when you choose a Carrier Infinity Gas Furnace.